Last night, Donald Trump finally got the opportunity to address a joint session of Congress and deliver his second State of the Union address. The speech was billed by his team as one that would call for unity after the President’s debilitating government shutdown. Political pundits pointed out that after most presidents endure a poor showing in the midterms, they typically take a more humble approach in their SOTU message. Needless to say, that didn’t happen last night. While he read the words from the teleprompter about unity in the beginning and the end of his remarks, the middle was classic MAGA-Trump talking points. He still wants his wall (apparently another caravan has materialized in his imagination just in time for this speech), he railed against a woman’s right to choose, and bragged about his cozy relationship with North Korea’s brutal leader Kim Jong Un. He also wanted to repeat that African-Americans should thank him profusely for the lower unemployment rate—despite the fact that the number persists at double the rate of White Americans. But the craziest moment came when he issued a veiled threat to the members of the House saying if you want legislation, there should be no investigation. Then the country got to hear about another vision for America. 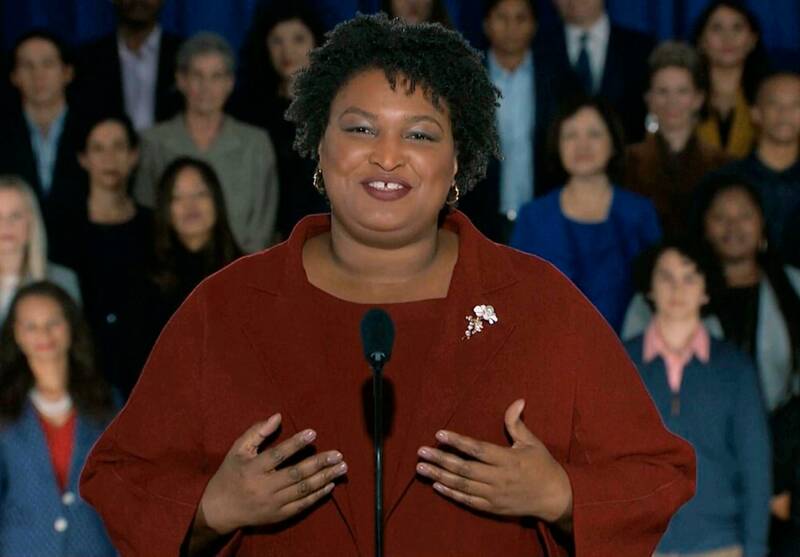 The America that Stacey Abrams envisioned in her Democratic response to the State of the Union was far more presidential, thoughtful and inclusive than Trump’s divisive message. Abrams, who made national headlines when she ran for governor of Georgia in the 2018 election and only lost by 54,000 votes, made history as the first African-American woman to deliver the Democratic response. And she did not disappoint. Abrams began with a passionate story about her father and led us into what could be viewed as a new campaign slogan, “We are coming for America.” She was able to do in eleven minutes what some can’t do in two hours. She outlined a vision for what Democrats stand for: opportunity for all, a welcoming country, sensible gun legislation, excellent education opportunities for all children and expanding healthcare-even evoking her own personal story of helping with medical bills related to her father’s recurring prostate cancer. 1) Trump’s government shutdown was a stunt. 3) For the President to lead us, he has to actually tell the truth. 4) Voter suppression is real. This last point, for me, is the biggest takeaway from her speech. Abrams election outcome is the poster child for voter suppression and she plans to work hard to overcome that in the future through her new organization Fair Fight Georgia. All Americans, regardless of party, need to do everything we can to ensure that what happened in Georgia and other states, doesn’t happen again in 2020. We have the time, the resources and the will, so now we need to get to work. We must ensure that everyone who is eligible to vote can and that those votes are counted. The state of our union depends on it.